Pastry chef David Lebovitz is known for creating desserts with bold and high-impact flavor, not fussy, complicated presentations. Lucky for us, this translates into showstopping sweets that bakers of all skill levels can master. 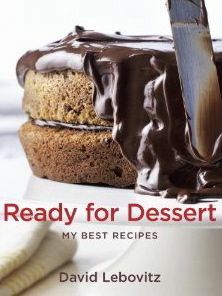 In Ready for Dessert: My Best Recipes, elegant finales such as Gâteau Victoire, Black Currant Tea Crème Brûlée, and Anise-Orange Ice Cream Profiteroles with Chocolate Sauce are as easy to prepare as comfort foods such as Plum-Blueberry Upside-Down Cake, Creamy Rice Pudding, and Cheesecake Brownies. With his unique brand of humor — and a fondness for desserts with “screaming chocolate intensity” — Lebovitz serves up a tantalizing array of more than 170 recipes for cakes, pies, tarts, crisps, cobblers, custards, soufflés, puddings, ice creams, sherbets, sorbets, cookies, candies, dessert sauces, fruit preserves, and even homemade liqueurs. Lebovitz also reveals his three favorites: a deeply spiced Fresh Ginger Cake; the bracing and beautiful Champagne Gelée with Kumquats, Grapefruits, and Blood Oranges; and his chunky and chewy Chocolate Chip Cookies. His trademark friendly guidance, as well as suggestions, storage advice, flavor variations, and tips will help ensure success every time. Accompanied with stunning photos by award-winning photographer Maren Caruso, this new compilation of Lebovitz’s best recipes to date will inspire you to pull out your sugar bin and get baking or churn up a batch of homemade ice cream. So if you’re ready for dessert (and who isn’t? ), you’ll be happy to have this collection of sweet indulgences on your kitchen shelf — and your guests will be overjoyed, too.